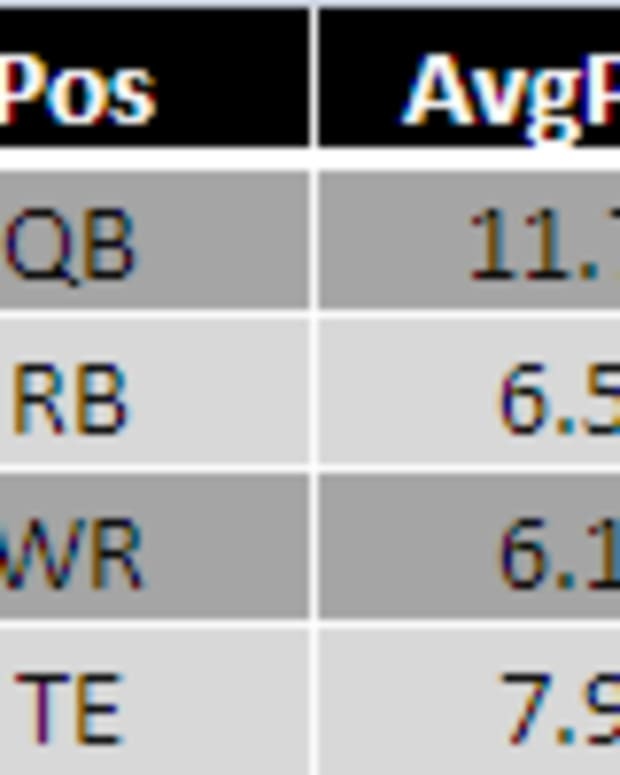 Last Saturday, we took our first (entirely modest) step towards providing fantasy advice that&apos;s also in line with the defining principles of the work here at Advanced NFL Stats. Some early comments on that Saturday piece led to research in the area of pass/run distribution by Win Probability (WP), with the discovery that a team&apos;s play-calling is pretty seriously informed by their in-game WP -- potentially valuable information for the fantasy owner. Further work in this area last Tuesday by Chase Stuart of the NY Times&apos; Fifth Down blog gives us a portait of every team&apos;s "platonic" run/pass mix -- that is, run/pass mix stripped of game state. Matt Hasselbeck is actually available in 55% of leagues (i.e. slightly above the 50% threshold), but the next-best alternative, John Beck (8%), appears to have only a tenuous grasp on the starting job in Washington. Hasselbeck has actually been pretty efficient, having posted a 104 NY/A+ this season. With the collapse of the Titan running game (Tennessee has a league-low 30.9% run success rate), the team has skewed pass heavy -- and will likely be passing late against a favored (0.62 PROB) Carolina team. The Packers are the most heavily favored team per Game Probability this week, with a 0.86 mark at home versus Minnesota. The most likely scenario sees them mounting a commanding WP advantage by halftime and utilizing the running game heavily. Accordingly, Ryan Grant (39% owned) figures to see a number of second-half carries in tandem with James Starks. I&apos;d take the over on Grant&apos;s average of 8.7 carries per game. Cleveland&apos;s Chris Ogbonnaya (25%) is a decent add, too, with Peyton Hillis and Montario Hardesty both out and a run-oriented Browns team favored (0.57 PROB) over St. Louis. Chicago receivers Earl Bennett (31% owned) and Roy Williams (12%) received seven and six targets last week during a Bear victory over Philadelphia. This week, a pass-oriented Chicago attack will likely play a number of competitive minutes at home against the Lions. Tennessee&apos;s Damian Williams (2%) is another good -- and widely available -- option: not only has he received a fair share of targets of late, but No. 1 receiver Nate Washington is listed as questionable ahead of Sunday&apos;s contest. Baltimore tight end Dennis Pitta (0% owned) has received eight targets each of the last two weeks. Not only is that more than teammate (and fellow tight end) Ed Dickson (14 targets total), but more than most other tight ends in the league. Per Stuart&apos;s method, Baltimore is the second-most pass-heavy team. While still favored (0.62 PROB) away at Seattle, their advantage isn&apos;t entirely decisive. Defensive point settings vary considerably league to league, but it&apos;s generally the case that the heavily favored teams (by PROB) are the best to pursue. Not only are those teams likely to limit opponent scoring, but are also the teams more likely to benefit from less predictable low-frequency events like interceptions and defensive touchdowns, as their (i.e. these heavily favored teams&apos;) opponents are more likely to resort to high-risk offensive plays. This week, Carolina&apos;s (0.62 PROB, 3% owned) and Kansas City&apos;s (0.61 PROB, 36% owned) defenses most closely match that criteria while still being mostly available.